Semi-modular synthesizers are nothing new – the likes of Moog, Arp, Buchla and more were producing patchable analogue instruments throughout the ‘70s and ‘80s. But with the recent rise in popularity of Eurorack modular synthesis, and the ongoing trend for affordable analogue instruments, CV-equipped, re-routable synthesizers are very much back in fashion. The good news is, you no longer need to remortgage your house to get into the semi-modular game. As you’ll see from our round-up, there are plenty of great hardware synths available for all price points; from budget desktop modules to expansive keyboards and sequencer-equipped beasts! As a complete package, there’s a lot to like about the Microvolt. 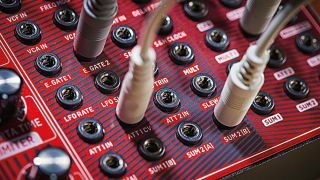 Its patchbay might lack the extensive patching options of, say, the MiniBrute 2 or even Behringer Neutron, but it feels like it’s been carefully designed to offer exactly the tools needed to get the most out of its interesting synth engine. As with the Make Noise 0-Coast, the combination of traditional subtractive and ‘West Coast’ synthesis tools makes the Microvolt genuinely exciting to experiment with. The deceptively deep modulation sources and MIDI to CV tools add to this too. Pittsburgh Modular describes the Microvolt as “a love letter to the analogue monosynth” and that feels fairly apt. Sonically it touches on a little of the modulated weirdness of the Arp Odyssey, the creative textures of Buchla’s Music Easel and even the punchy bass sounds of the SH-101, all while maintaining a character of its own. The Korg MS-20 was originally launched in 1978 (discontinued in 1983) and is certainly one of the most iconic monosynths of all times. Initially regarded as a poor man's ARP 2600 because of its similar semi-modular design, it soon became a cult classic within electronic music circles, largely due to its versatile dual filters which enable the easy creation of twisted sounds, killer FX, drum hits and staple leads and basses. Korg’s 2013 re-issue is two thirds the size of the original, but beyond that it does an amazing job of recreating the sound and feel of the MS-20 – at a fraction of the price the originals go for second-hand. The original MiniBrute was a fairly straightforward monosynth with a few unique touches and some CV control, but version 2 is fully semi-modular, boasting a beefed-up synth engine and a comprehensive mini-jack patchbay. The MiniBrute also now comes in two varieties: the standard keyboard version, now equipped with a Keystep-style sequencer, and the 2S, which swaps the keys for a pad-based step sequencer similar to the BeatStep. While both feature a sequencer and arp with outputs that can be patched and routed to external gear, the 2S goes deeper on this front with lots of great CV and modulation control that makes it the perfect base for a larger modular rig. If expanding your semi-modular into full Eurorack territory is your goal, try pairing a MiniBrute 2 with Arturia’s compatible RackBrute case for a sleek, portable setup. Behringer’s synth business might be best known for their controversy-courting ‘tributes’, but the German brand also have a couple of excellent original instruments under their belt. Following in the steps of last year’s Deepmind, Neutron is an analogue semi-modular that packs in a lot of flexibility for its very affordable price point. The Neutron has a few flaws and there are some frustrating design issues but it does sound good, and in terms of bang-for-your-buck, it’s quite a steal. While it does a very good job at creating more sensible sounds, it also excels at the weird and wonderful. Behringer might just have a winner on its hands. Like its sibling the Mother-32, DFAM (or Drummer From Another Mother) is a semi-modular hardware instrument that combines classic analogue synth elements with a built-in sequencer and Eurorack-friendly patchbay. However, where the Mother-32 is a classic monosynth design, DFAM is more esoteric, designed to specialise in electronic percussion, atonal textures and punchy synth sounds. It’s great at what it does – creating really unique percussive sounds, punchy synth bass hits and interesting FX. With no MIDI input though, DFAM is more like an addendum to the Mother-32 ecosystem – or a partner for an existing Eurorack system – than a standalone studio instrument. North Carolina-based outfit Make Noise is known for making portable systems that travel extremely well yet still provide great creative depth. Enter the 0-Coast, or 'No Coast' as it is pronounced.Designed to emulate the sensibilities of both the Moog and Buchla/Serge worlds, this compact piece of kit is about the size of a tablet computer, yet still packs in a tremendous amount of sonic creation and manipulation options for a very tidy price. Make Noise never seems to fail on building circuitry that delivers both personality and depth. The subtleties of dialling in overtones and then fattening them up with the Multiply circuit bring a great amount of variation to the table. 0-Coast is perhaps a little more complex to get your head around than some in this round-up, but it’s worth the investment of time. Fusebox is a three-oscillator monosynth which uses entirely analogue circuitry for all its sounds generation, modulation and internal control functions. The only design aspect that acknowledges the digital age is the inclusion of a MIDI interface that generates a range of CV and gate signals from the external world. It also features several onboard generators, including the Patternator, which is an interesting combination of CV and gate sequencing sources. 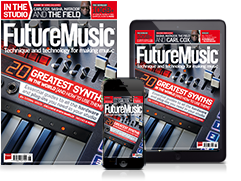 The Fusebox is a great-sounding synth in its own right, but add in this pattern generation, along with the arpeggiator, MIDI control and patching and it takes on a character and style very much of its own. Well worth a look! Athens-based brand Dreadbox have been steadily expanding their offering of hardware synths in the past few years, and garnering attention with impressive analogue instruments like the – now discontinued – Hades bass synth and their Abyss poly. NYX is one of several semi-modular desktop synths in their range, which expands on its punchy, rich synth engine with a small but effective patchbay. The real highlight here, however, is the included reverb, which comes courtesy of pedal brand Crazy Tube Circuits and adds a touch of gorgeous space and character. NYX might not have the extensive patching options of other synths in this round-up, but for its compact size it has a decent amount of flexibility and an impressive full-bodied sound. At its core, this is a keyboardless, rack-mountable version of Roland’s System-1 ‘Plug-out’ synth – a unique digital instrument with a synth engine that can be loaded with digital emulations of a variety of Roland classics. Here, however, we also get an array of Eurorack-style patch points, which are a very unusual and highly alluring inclusion for a digital polysynth. The patching capability works very well, albeit with the limitation that sound-generation in this mode is monophonic. The new synth models available via the Plug-Out system really extend the sonic scope, though there are some compromises here in terms of control assignment for the front panel. This is a good-sounding synth with plenty of flexibility, though it’s questionable who this is really aimed at. Ultimately though, we commend Roland for taking a new approach to the analogue vs digital debate.